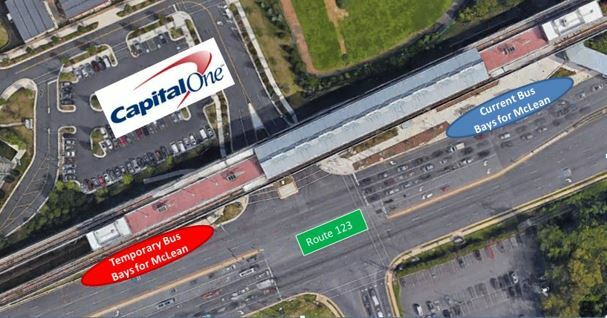 Bus stops along the southbound lanes of Route 123/Dolley Madison Boulevard in front of McLean Metrorail Station will remain temporarily relocated about 200 feet south for the week of Jun 11-15 to allow Silver Line-related roadwork. The affected bays are between Scotts Crossing Road and Capital One Tower Drive. The change will allow the Dulles Corridor Metrorail Project to make road and underdrain repairs. When: Monday, June 11, through Thursday, June 14, 9:30 a.m. to 3 p.m.
Friday, June 15, 9:30 a.m. to 1 p.m.